Los Angeles has always been a town for Christian extravaganzas, from Aimee Semple McPherson’s services at the Angelus Temple (where, as the collection plates were passed up and down the pews, she would admonish “I want to hear a SILENT collection!”) to mega-preacher Billy Graham at the Coliseum to an actual Pope (John Paul II) at Dodger Stadium. Perhaps you are a “blue-domer” (like me) or maybe even a full-on heathen, but either way it’s difficult to deny the coolness of the Easter Sunrise Service at the Hollywood Bowl. Strangely enough, the reason for the Bowl’s existence is directly connected to this 94-year-old tradition, which began on March 27, 1921 in old Daisy Dell, soon to be known as the Hollywood Bowl. The first affair was a fairly simple one, with 2,000 faithful folk gathering in the pre-dawn darkness. Bugles and trumpets sounded at 5:40 a.m. as the poem The Master is Coming was read, and the Philharmonic Orchestra played “Holy, Holy, Holy” as the sun peeped over the hills. At the time there was no stage, no seating, no trademark shell, but the acoustics were nothing short of heavenly. 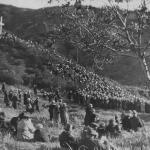 The “Hollywood Bowl Easter Sunrise Service Committee” bought the land in 1921 and passed it on to the county in 1924 for the continuation of the tradition. 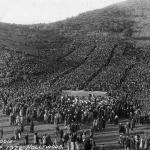 The Bowl’s famed shell along with a platform for musicians was added in 1926. An actual stage was erected in 1927. Over the years, the Sunrise Service grew larger and more popular, punctuated by the Children’s Living Cross Chorus, which features 150-plus children in black robes placed in a cross formation on stage. When dawn breaks, they drop their robes to reveal pure white vestments underneath. 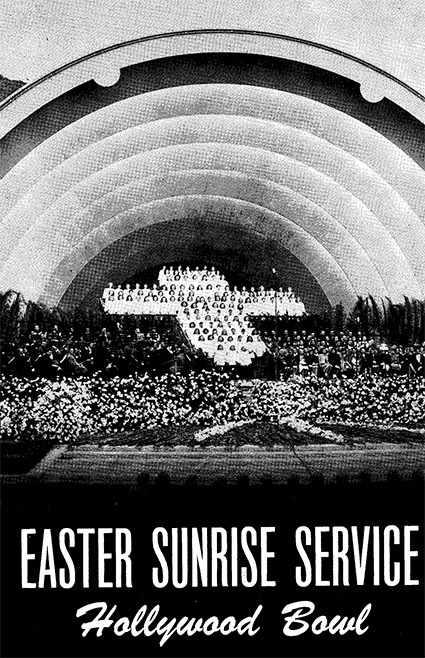 With the playing of Beethoven’s Hallelujah, the release of 200 white doves, and as many as 650 participants on stage, the Easter Sunrise Service at the Hollywood Bowl became one of Southern California’s most unique religious experiences. 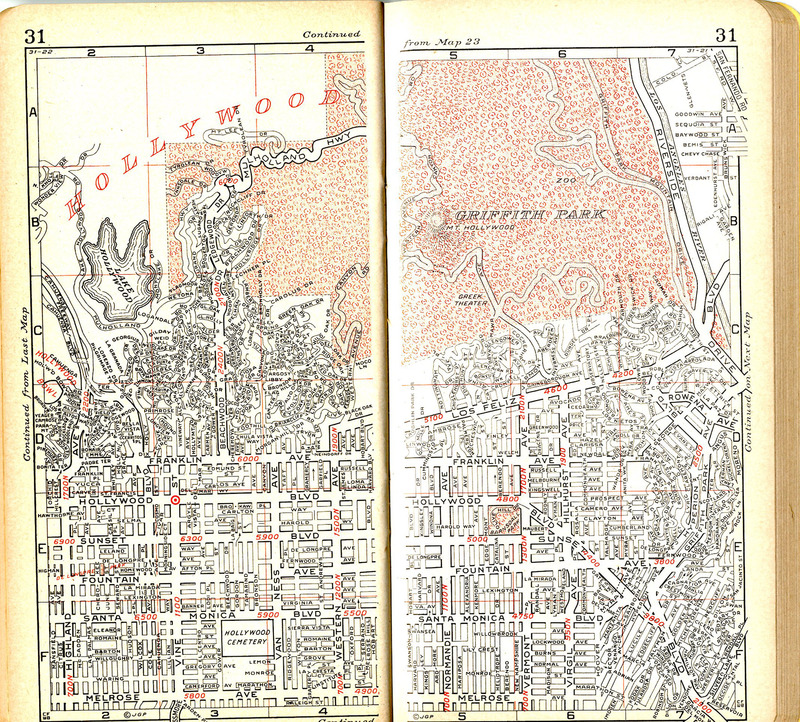 The fact that the Hollywood Bowl shows up in red letters on the landscape in this 1925 Gillespie Guide demonstrates the meticulousness of the Gillespie operation, which had been directing Angelenos in automobiles and streetcars since the previous decade. It was Gillespie (along with Hill’s guides) that got the local commuters around the city until Jack Renie and the Thomas Brothers showed up in the 1940s. 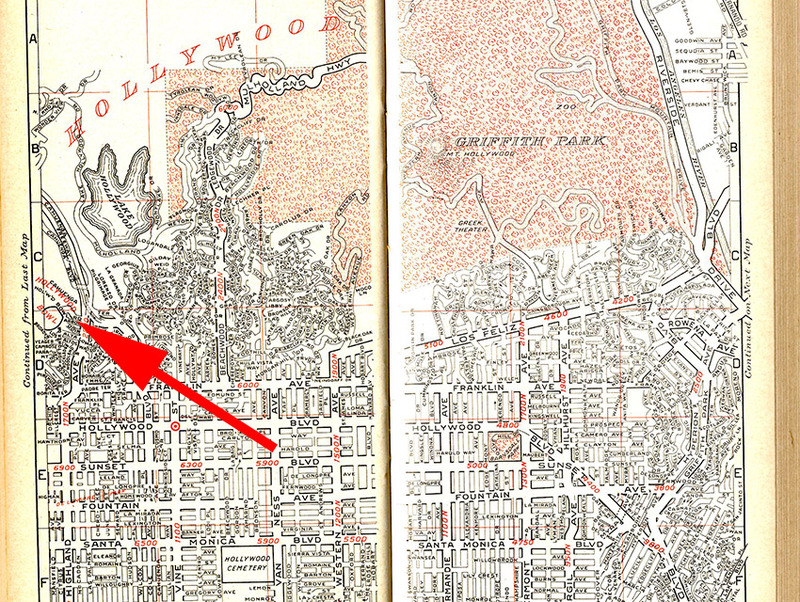 Since the Bowl was, at the date of this map, nothing more than an acoustically agreeable spot in the hills, this cartographic record is impressive.